This year, Connor wanted to be a dragon rider. We built this out of spray insulation foam over 2 pop up hampers for the body and pool noodles for the neck and tail. The wings, which open and close, we bought on Amazon (https://smile.amazon.com/gp/product/B00YSGZN1I/ref=oh_aui_search_detailpage?ie=UTF8&psc=1) and then cut in half and attached one to each side. The fire that comes out of his mouth is 3 of those party favors that you blow into and they unroll. They are attached to several straws that I taped together and made to look as if they were his reins. When he raised them to his mouth to blow, the dragon breathed fire. The fake legs on the side were just a pair of his old jeans that we cut in half and duct taped to sides. We stuck pencils in right under the knee for support, and when he walked, the feet swung like he riding. We did this over the course of 12 weekends, just doing a little piece at a time. 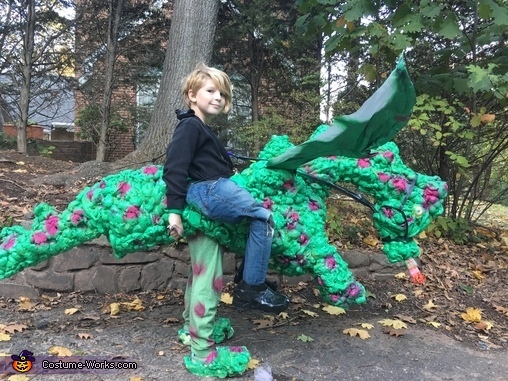 I had toyed with the idea of making the eyes light up, and Connor could have rigged it for me, but decided not to, because what I liked about this costume was that it was a dragon that could breathe fire and flap his wings, and yet was completely low tech. To see it in action you can go to https://youtu.be/SAvCHuI9Ei0, if that is permitted by the contest rules. When it was complete the whole thing was much heavier than we had planned for and I didn't think that he would be able to trick or treat in it. However, I did not count on the stregth that the constant acclaim would lend him. Every step we had to demonstrate the costume's functionality to an oohing crowd of other trick or treaters. Houses that were out of candy raided thier childrens' caches to give to us. People posed for pictures with Connor and took videos. My son trick or treated for hours, and then, best of all, went right to bed saying he was tired.